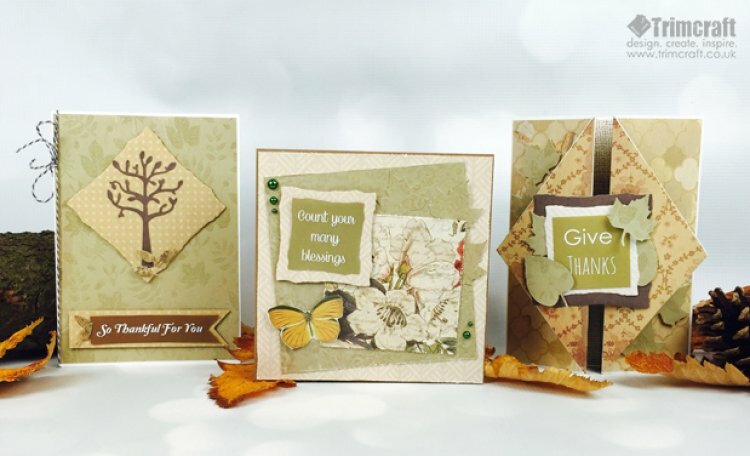 Whether you celebrate thanksgiving or not, these gorgeous cards featuring our free topper templates are perfect when you have something to be thankful for. 1.Take two 5 x 7 card blanks, score in half and fold back the front of the each card. 2.Find the centre point on the free edge of the card and draw a line top and bottom from the score line to the centre point. Cut along the line to create a diamond shape. Turn on card over and adhere the cards together along the back so that the two diamonds come together. 3.Cut two 6cm x 17.5cm strips to adhere to the outside then repeat to make two strips to adhere on the inside panels. 4.Cut two triangles to adhere on the front diamond panels. To help you measure, fold your diamond flat and place a piece of plain paper under, use this to trace the diamond shape. 5.Die cut the 7.5cm nesting die to create a base for the topper, layer with the 6cm nesting die, adhere to the front of the left diamond. 6.Add the free sentiment then die cut some of the leaves from the foliage die set and adhere around the front of the card. 1.Cut a piece of backing paper to 17.5cm x 12.5cm then adhere to the card blank. 2.Die cut a 7.5cm nesting die shape; adhere to the card blank using foam squares to create a diamond shape. 3.Die cut the tree from the foliage set and adhere to the diamond and dies cut five of the smallest leaf die cuts. 4.Cut a strip of backing paper 11cm x 2.5cm cut a fishtail V on the right edge, mount on the bottom of the card using foam squares. 5.Add the sentiment to the strip and some twine tied with a box to finish. 1.Cut a 15cm square from the backing paper, lightly distress the edge and adhere to the card blank. 2.Cut a piece of 12cm square backing paper, lightly distress the edge and stick down at an angle to the card. 3.Cut a 9cm square from the pad distress the edges, diecut 3 leaves and adhere to the card blank with the leaves fanning out from the top right corner. 4.Die cut a 6cm nesting die shape and adhere to the top left of the card, add the sentiment die cut with the 4.5cm nesting die and glue down. 5.Cut a butterfly from the pad and adhere to the card at the bottom right, bend the wings slightly. 6.Add some gems to the card to finish. These toppers will be useful for so many projects so make sure you save them and don’t forget to share your makes in the project gallery.